IAP2’s Licensed Trainers are not just passionate about public participation. They are highly qualified practitioners who have honed their P2 knowledge and skills. They share the expertise they’ve gained with beginning through advanced P2 professionals in IAP2’s signature courses. Several IAP2 Trainers have distinguished themselves by earning the coveted CP3 or MCP3, an honor bestowed by their peers that recognizes their competencies against more than 30 criteria. 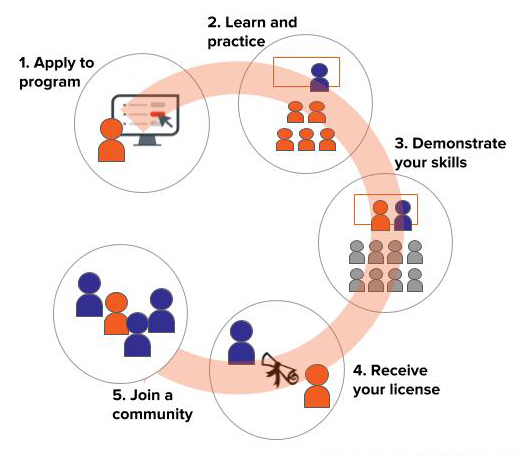 The journey to become a trainer includes online and/or face-to-face classes taught by IAP2 faculty, observation of IAP2 trainers in action, co-teaching experiences, and written and oral assessments. Throughout the journey, individuals receive coaching and mentoring from IAP2 faculty. Most individuals complete the requirements in 6-12 months. The journey culminates with a license to deliver IAP2 courses anywhere in the world. To meet the worldwide demand for our courses, IAP2 periodically recruits for new trainers. To prepare for the journey, individuals begin by applying to one of IAP2’s two train-the-trainer (T3) programs: IAP2’s Foundations T3 program will prepare you to deliver IAP2’s 5-day Foundations in Public Participation. The Foundations T3 program also prepares you to deliver IAP2’s Public Participation for Decision Makers course. IAP2’s Outrage T3 program will prepare you to deliver IAP2’s 2-day Strategies for Dealing with Opposition and Outrage in Public Participation. To receive updates about the programs or to find out when the application period opens, click here. April 22,2019 - Applications to Become an IAP2 Foundations Licensed Trainer Open May 1. Read the release.